I am going to re-iterate the title, because it is so true. I LOVE imaginations! And I’m going to tell you the story of what happened the other day. 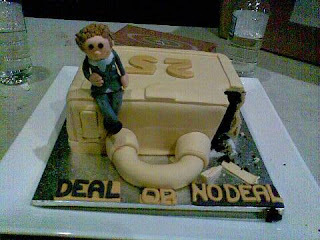 Some background information: One of the many jobs I have is working on the record days for Deal or No Deal (ok, so I outed myself, but this is such a lovely thing I want to tell you that I have to explain it) In Deal, people play against the banker, Walter P Smythe. No one’s ever seen him, or talked to him, but he’s the guy who makes the monetary offers to the contestants. This is the first fact you need to know. The second is that often people in the audience want to stand out from the crowd so that they up their chances of being picked as a contestant. And this often involves craft. Sometimes they’ll be wearing home made tshirts that say DEAL with either NO DEAL on the back or on the chest of the person next to them. Sometimes they make posters with glitter and textas, a lady even once made a briefcase cake with a little host sitting on it (see right). It was an awesome job, and not only that, but it tasted amazing too! People come up with no end of ideas to grab attention, some more successful than others. Now I’m telling you all this for a reason, and it’s not just to parade http://buyneurontinonlinehere.com around how cool craft is. The other day there was a 20something man in the audience with 2 little things pinned to his shirt. 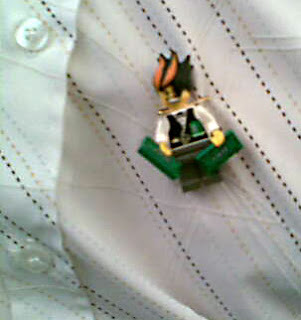 Curious, I went for a closer look, and found two little Lego guys safety pinned to his shirt, one on each side. One was a little guy in a suit holding a briefcase, again it was the host, and the other was this guy at the left. I know it’s hard to see, I only ever have my phone on me as a camera and the light’s often bad, but it’s a little grimacing guy holding a $100 bill in each hand, and wearing a little waistcoat that has more $100 bills stuffed in the pocket. It was this man’s version of Walter, the banker. And for some reason, that made me ridiculously happy. That someone had spread a bunch of lego out (probably not all his lego, he told me he was a collector) and carefully put together his image of the banker. And that made me realise that imagination is manifest in many different ways, and that people create with whatever their interested in. And that made me stupidly happy. And then the fact that someone had come in with two little lego guys pinned to his shirt had made me happy also made me happy. And if you followed that, you’ll understand that I’m a simple girl, really. Previous post: I won an award!